"SiCortex 5832 is a 5-teraflop single-unit supercomputer." "It uses low-power, custom 64-bit MIPS-processor packages, which are basically entire computers on a single chip. 5832 processor cores and 8TB of RAM in one chassis, which draws less than 20 kilowatts of power." 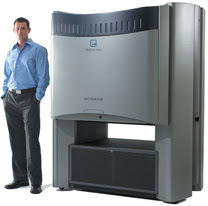 "The SiCortex systems are completely open source, even down to the microcode." They even say it runs a modified version of *cough* Gentoo Linux and the (now Sun) Lustre Filesystem. 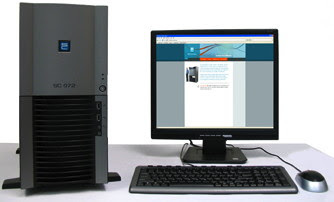 SiCortex also offers a 72 CPU desktop machine that's as big.. well, as a desktop machine :-).